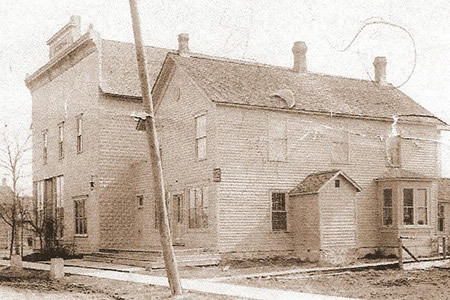 There was a smaller building, later used as an ice cream parlor and now located at the Scandia, built first and used as a tavern. 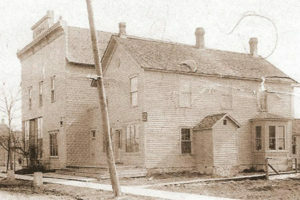 Later in 1908, August Schram added the large building, which served as a tavern and dance hall. The upstairs of the dance hall was used for storage at this time. August passed away in 1917 from an infected tooth which led to blood poisoning. August was the son of Martin Schram Sr. and Paulin Fons. They lived in the Polish Settlement on E. Martin Schram was from Krucz, Posem, Poland. Pauline came from Poland also near the German Border. She had been a governess and spoke several languages. 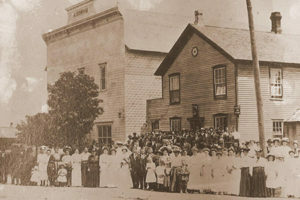 They married in 1878 At St. Mary’s in Baileys Harbor. They were actually charter members of the church along with Martha’s grandparents, Theodore and Josephine Zak. She was the daughter of Samuel and Theodora Zak Kaczmarek. Some of the Kaczmarek’s still live on the family farm on E.
August left behind his widow Martha, and four children: Leon, Angie, Lucille, and Dorothy. In 1920, Martha remarried to Jack Wasserbach and had one more child, Lloyd. After marriage, Martha opened up the ice cream parlor in the smaller building. In the dance hall,there were masquerade dances and dances given by the art school students from Schook’s Art School in Frogtown. Movies were also shown every Sunday and were handled by Arthur Brungraber from Jacksonport. Whole families would come to the dances and the children would sleep upstairs while the adults danced. Martha would cook dinner for the dance orchestras then breakfast as they would stay overnight. In the ice cream parlor, cones were 5 cents, sundaes 15 cents. In the 40’s and 50’s they had movies and dances in the hall and there was roller skating on Sunday’s. The little room next to the bar was a cooler and storeroom. In the forty’s there was a slot machine in the tavern as well. There was a big barn in back and people boarded horses there to ride. Martha Schram Wasserbach died in December, 1963 and Jack died a month before in November, 1963. They sold the building to Harold and Dolores Kiehnau in 1964 for $25,000.00.